Spread among at least six continents are more than 1,000 species of land, sea or freshwater snails. Due to morphology, hermaphroditic reproduction and certain adaptations, snails can originate in many different habitats and environments. With the help of other species, they can find themselves thriving in new ones. Physically, snails are all pretty similar. Each possess a large muscular “foot” that allows for movement. The anterior portion of this organ is the head, which contains important sensory organs. The head has two tentacles and two eye stalks with an eye at each terminal end. A mouth with a jaw is also part of the head; it holds a rough tongue for ripping and tearing at plant or animal material. Protecting the snail body is a calcareous shell that forms in the larval stage and grows, with each successive whorl pushing the apex of the shell outward. Snails are generally hermaphroditic; they utilize sexual reproduction to help maintain genetic diversity. However, mating and fertilization vary, and are quite dependent on environment. Aquatic snails use their water source to transport sperm cells to eggs; thus many of these species are "aphallous." In contrast, land dwelling snails transfer sperm in packets, with mutual copulation occurring and both hermaphroditic snails exchanging sperm. In some species, these sperm packets are not used immediately but rather are accumulated within the receiver while this snail seeks a fitter mate. Such an adaptation is met with another: The Roman snail will inject a “love dart” full of chemicals and hormones into its mate, influencing the muscle contractions of the receiving snail's sperm oviduct and increasing chances of sperm survival and subsequent fertilization. The earliest snail species originated in shallow waters. Gills facilitated this lifestyle; they still do for many saltwater and freshwater species. But as some water sources dried up, and resulting habitat became more muddy and less oxygen rich, a functional lung developed to allow the snails to survive, rise to the surface to breathe and, over time, become primarily land dwellers. Land snails likely originated from freshwater species rather than saltwater ones, as less adaptation is needed to offset osmotic requirements. 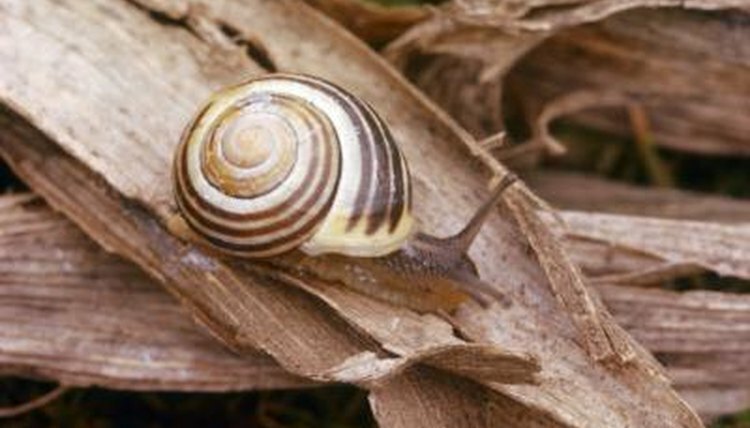 Present-day snail species can live in many environments, from desert to the deep sea. Scientists have found genetically identical snail species on continents separated by large bodies of water. Seemingly, the only explanation for snails found both in France and Ireland, but not in between, is that, with their muscular foot, they are able to latch onto ships or any other traveling object, and hitch a ride. In another, far more unusual, scenario, scientists at Tohoku University found that 15 percent of small land snails are able to survive being eaten, digested and excreted by birds. Small size and the calcified shells in which the snails can retract protect them while en route to a new habitat, even in the belly of their hosts.